As I've written before, Opening Weekend of deer season is a much anticipated highlight of my year. Unfortunately, a few years back, it was a bit more painful than most and after the word got out, it became more and more painful to rehash the story each time. To save myself breath, embarrassment and pain, I reduced this particular Saturday's events to the barest essential elements so others might learn through my errors and so I can “get it out there” once and for all. Upon arriving about 20 minutes late to the hunting camp, I quickly unloaded my friend’s borrowed Kawasaki Mule, donned the appropriate clothing, loaded the trusty .308 and headed North to Creek #2. The past rains were evident in the area with many of the lower areas and trails muddy and holding water. No worries. We'd seen much worse in this area and besides, it was Opening Day and the Mule was a 4-wheel drive model. After parking in some heavy brush ~100+ yards from the tree stand, I applied the vile smelling "doe in heat" scent to a felt pad tethered to my boot, took an indirect route to the stand to ensure scent was dispersed widely, and climbed to my perch. Several deer were seen with the majority of the activity taking place about 125 yards ahead, across Creek #2. The thick brush offered no chance of a shot at a solid 8 pointer which happened by, tailing a hot doe. A doe and 5 month old fawn did come directly through the area and made a heroic effort to cross the creek without getting wet. I thought it was odd they tried to jump across versus simply wade like they normally do. (Editor's Note: When you think something is odd, RIGHT THEN, think about what, specifically, might be odd...) They passed within 30 yards of my stand without knowing I was there. What a beautiful morning. About 10:30, it was time for a change. Since the majority of the deer were seen on the other side of the creek, it only made sense to move. After retrieving the Mule, I approached the soon-to-be scene of the accident. 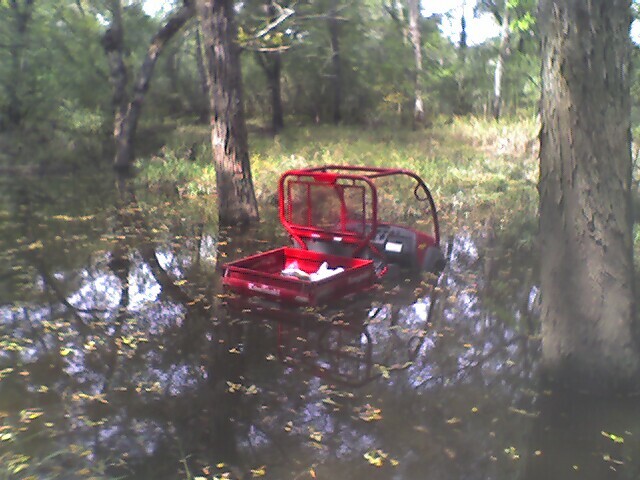 Keep in mind, the Mule has made it through this creek several times and the only casualty to date was a lost set of keys and some displaced mud. I walked into the water about halfway through the creek with the water not quite reaching the tops of my calf-high rubber boots. Fine. It had a bit more water in it that normal but it had recently rained. This corresponded to a depth barely above the floorboard of the UTV. I'd have to remember to wash the Mule prior to its return. Just in case there was a problem, I put down my pack and rifle on the side of the trail. (Editor's Note: Probably the smartest thing that I did all day). The Mule was eased into position, the differential locked, the 4WD engaged while I sat with a double white-knuckled grip on the wheel. I entered the water at a fair clip and then gunned the engine, assuming the momentum would take me across with only wet boots to show for my trouble. Yessiree, you gotta love hunting. PS - I was very, very lucky that the engine stalled out prior to actually ingesting water. They flushed the engine and all fluids 3X, cleaned everything up and buttoned it back together. The repair bill was, in the big scheme of things, the cheapest education I've ever earned. PSS - I bought a decrepit COOT ATV and after teaching myself to weld and cut metal, fixed it. This is a story for another day but let's just say I'm now the proud owner of a Honda Rancher. The diagram still gets me every time! Raised by a pack of wolves, I did not take up hunting (with a gun) until my early 30s. Copyright 2010-2016. Picture Window theme. Theme images by Nikada. Powered by Blogger.